When many homeowners discover a leak in their roof, they pull out the ladder and hop right up onto that roof to start working. However, many other homeowners don’t have the knowledge, time, energy, skills, or desire to fix a leaking roof on their home by themselves. For those with a lack of roof knowledge, hiring a roofing contractor is some of the best money they could ever spend. For these people, calling a contractor and hiring them to come out and fix their roof is often their best bet. It may cost them a little bit more money, but it’s something they don’t have to worry about, put time and effort into, and it’s just done. On top of that, they often get warranties from the contractors that they may not get if they perform the work themselves (Although DIY projects through PM Home-Sil do come with a warranty). 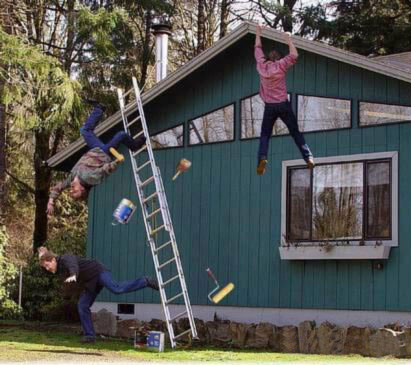 Don’t let this happen to you; hire a roofing contractor if you don’t know what you’re doing. Trying any DIY project when you have insufficient knowledge can be a nightmare, but when the project is on your roof, meaning a mistake can cost you thousands of dollars as well as a wet home, the stakes become much higher and the pressure is often too much for homeowners. If you’re trying to build a couch out of a pallet and you get in too deep, that’s not a huge mistake, you simply start over or buy a couch. However, if you trying to fix a leaking roof without proper knowledge, that becomes a much bigger and more costly error. Attempting to fix a leaking roof on your own is a bold and noble decision, but it may not always be the best decision. If you simply do not know what you are doing and are not capable of performing the work yourself, you shouldn’t even start the project because it will take more time, energy, and effort than it is worth. However, if you can do the work yourself, then we’d love to partner with you by providing you with the necessary materials.